This is a simple, yet elegant dish. The salmon pairs perfectly with our Rodelle Salmon Seasoning. And the lemon juice adds just the right amount of tang to really bring the salmon to life. Place salmon in a shallow ceramic baking dish. Squeeze juice from 1 lemon evenly over salmon. Drizzle Olive oil over salmon and with tongs makes sure the fillets are all evenly coated. Sprinkle Rodelle Salmon Seasoning over the top of the salmon evenly, cover and let marinate for 30 minutes in the refrigerator. Preheat oven to 350 degrees, slice remaining lemon into slices 1/4 inch thick. 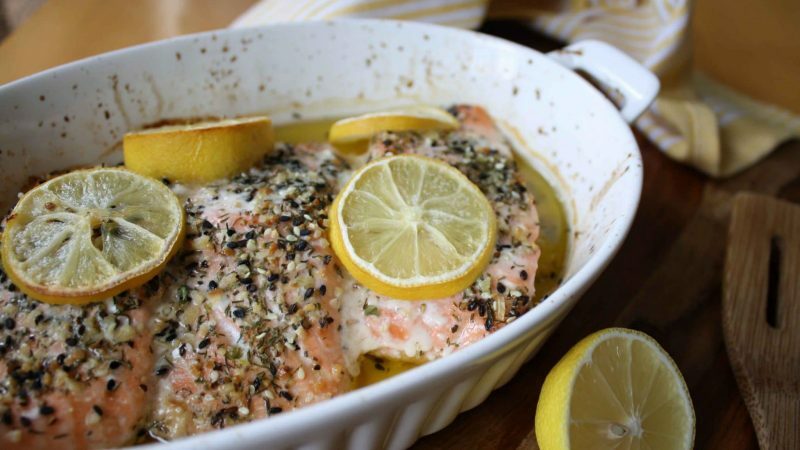 Remove baking dish from the refrigerator, drop lemon slices over the top of the marinated salmon bake for 35-40 minutes. Serve with salad or risotto.